The recently launched 2 mm Safety System is not only lightweight and small, but also highly functional in measuring devices for test and laboratory equipment. The 4 mm Legacy Safety System sockets are compatible with all 4 mm plugs and comply to IEC 61010 (CATIII/1000V). Their gold plated finish and nine colour options allow various applications in front panels, connection and workplace systems. Clamp type test probes with diverse grip jaw constructions and test probes with strong or sprung stainless steel tips ensure expansion to measuring points that are unreachable by hand and clamp with constant force. 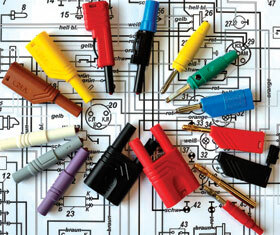 Measuring leads in various lengths and colours in both PVC and silicone complement the above offering. A selection of construction kits made up of a handy variety of test probes, clips and leads round off a product range essential to a sound test and measurement facility.